In a recent New York Times opinion piece, Parag Khanna, a senior fellow at the Lee Kuan Yew School of Public Policy in Singapore, outlines how social and economic development increasingly pivots around infrastructure corridors rather than arbitrary boundaries like state lines. Without intending to, this theory has lessons for the Mississippi River. There are a couple of things we on the Mississippi River should note. First, this development is already occurring in Asia and Europe, where intragovernment units are forming around rail lines and rivers. For us on the Mississippi River, this makes sense. For the last decade, concerns about the future of the Mississippi River have been voiced in interest groups that surmounted geopolitical boundaries like states, counties and cities. The interests ranged from water quality and transportation to tourism and flood plain management. As meetings progressed and concerns were shared, similar needs rose to the top. Today we have a report card, thanks to America’s Watershed Initiative, measuring the watershed assets of a region that roughly mirrors the Great Plains, Great Lakes and Gulf Coast regions set forward in Khanna’s article. Second, Mississippi River cities have become one of the most powerful voices for Mississippi River infrastructure. Their collective voices through the Mississippi River Cities and Towns Initiative have done more to raise the visibility of this American economic powerhouse. Third, Khanna points out urban corridors, while defined by the cities, benefit urban and rural alike. Their routes intersect with small and mid-sized cities, unifying interests in ways states aren’t able to achieve. So it is with the cities and towns of the Mississippi River. We in the Mississippi River are already benefitting from an urban connectivity-corridor model. More energy and public support could be generated for the groundwork that’s already been laid. 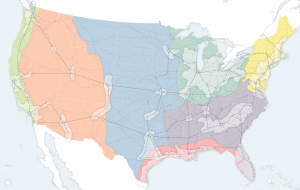 A National Dialogue for the Future of the Mississippi River, built on even greater connectivity via on-line, telecast deliberation among all regional stakeholders, could bring our corridors closer together still. The benefits of America’s great waterway are numerous and many of them are protected and promoted by special interests. 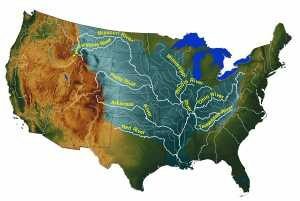 Enhancing the connectivity role of the Mississippi River throughout the United States will take collective action. Joining forces in inclusive planning will allow those benefits to be more widely applied for the nation’s future, just as they was in the past. This entry was posted in Economic, Future of the Mississippi River and tagged A National Dialogue for the Future of America's Waterway, America's Watershed Initiative, Mississippi River Cities and Towns Initiative, New York Times. Bookmark the permalink.